On november 8th 2017 The Hessischer Pilztag took place in Kerns in Switzerland. It was a very well-attended program with over more than 100 participants from all over the World. There was a company visit to Kernser Edelpilze. 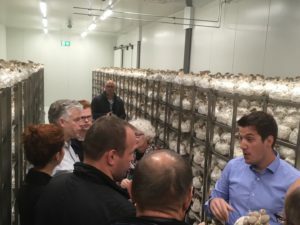 Where Sepp and Patrick Häcki gave a tour in the new substrate company where they produce on a weekly basis 250 tons of substrate for mainly pleurotus eryngii, shiitake and pleurotus ostreatus. Currently they produce about 100 tonnes of substrate in 1.3kg bags of which 40% is for their own farm and 60% is sold to other customers in Europe. Hollander Spawn delivers their PE and P80 every month. Since October Hollander Spawn has started a transport partnership with P.Daemen Transport in Maasbree.Since October Daemen will take excellent care of all Hollander Spawns transport in the Netherlands, Germany, Switzerland and Italy. P.Daemen is based in Maasbree (near Venlo), centrally located in the triangle of Holland, Belgium and Germany. Our service however stretches out across all of Europe. 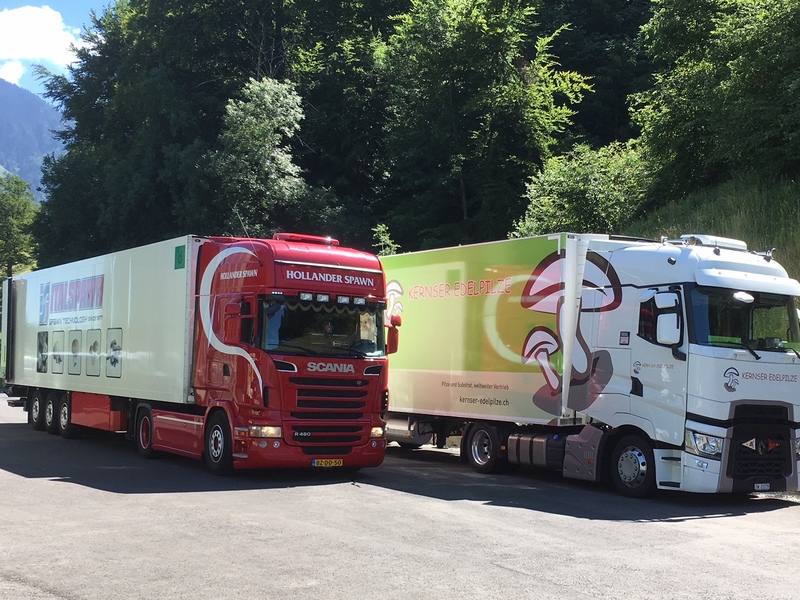 P.Daemen transports goods to not only the Benelux and Germany, but also to Austria, North Italy and Switzerland. Every year approximately 595,000 pallets based on 95,000 orders are divided across 24,000 trips. These transports include conditioned, non-conditioned and deep-frozen goods. From 1 pallet to full truck loads. 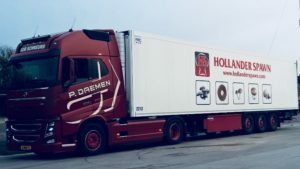 Relying on the efforts of highly-skilled personnel, decent modern automation and an advanced lorry park, P.Daemen will take on the responsibility of your consignment. In doing so, quality and reliability are our first priorities. As a result you don’t have to concern yourself with your products and you can instead focus entirely on your core business.